One trio has stood above the rest since the inception of the ROH World Six-Man Tag Titles more than two years ago, and that would be The Kingdom. Taven, O’Ryan, and Marseglia won a tournament to become the inaugural champions and have held the titles more times (three) and more days (216) than any other team. The Kingdom defeated two of the most celebrated groups in pro wrestling to begin their second and third reigns, knocking off SCU (Christopher Daniels, Frankie Kazarian, and Scorpio Sky) and The Elite (Cody and The Young Bucks), respectively. The Kingdom has never faced a team quite like the one they’ll be facing in Concord, however. Helms, Delirious and Luchasaurus are three of the most unorthodox competitors in ROH. 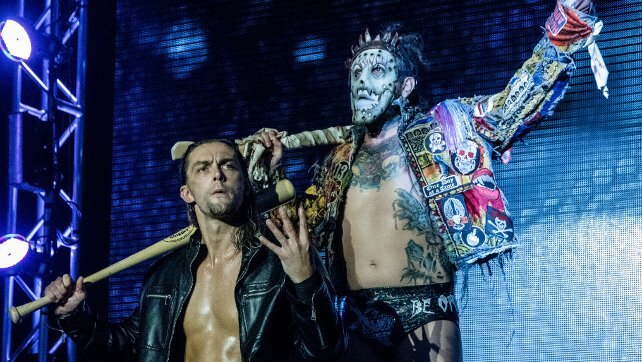 Although the three masked men have never teamed together, Helms and Delirious have joined forces in traditional tag matches on a couple of occasions. They upset two-time former ROH World Tag Team Champions The Addiction (Daniels and Kazarian) this past June. Can Helms, Delirious, and Luchasaurus pull an upset in Concord and earn a title opportunity? Join us in person or watch live on HonorClub to find out!